The first two are hardware interrupts whereas the others are software interrupts. 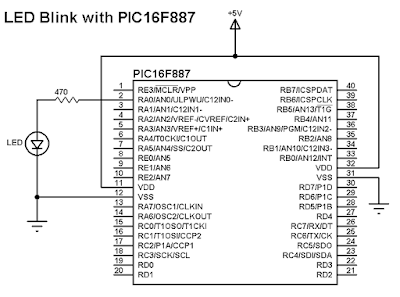 All of the PORTB pins are individually configurable as an interrupt-on-change pin. 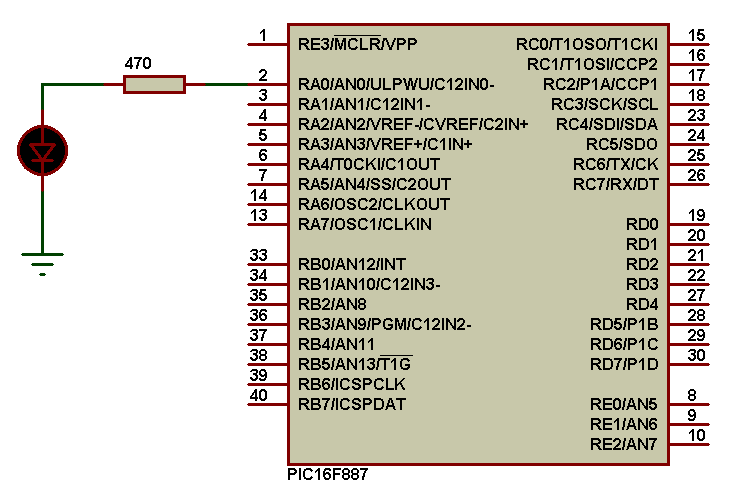 Example circuit schematic is shown below where there are 8 buttons and 8 LEDs. When we push a button the microcontroller will directly reads all PORTB pin status and displays the correspondent value on PORTD pins via the 8 LEDs. When used as a timer, the Timer0 module will increment every instruction cycle (prescaler = 1). There are 8 prescaler options for the Timer0 module ranging from 1:2 to 1:256. Timer0 will generate an interrupt when the TMR0 register overflows from FFh to 00h. The T0IF interrupt flag bit of the INTCON register is set every time the TMR0 register overflows, regardless of whether or not the Timer0 interrupt is enabled. The T0IF bit must be cleared in software. The Timer0 interrupt enable is the T0IE bit of the INTCON register. where preload_value is an unsigned 8-bit number. The clock source can be internal or external through RA4/T0CKI pin. where TMR0 is timer0 preload value. Period = 1/Timer0_freq which is time to interrupt. The TMR1 interrupt, if enabled, is generated on overflow which is latched in interrupt flag bit, TMR1IF (PIR1<0>). This interrupt can be enabled/disabled by setting/clearing TMR1 interrupt enable bit, TMR1IE (PIE1<0>). Prescaler rate of the timer1 can be: 1, 2, 4 or 8. Where TMR1 is preload value. 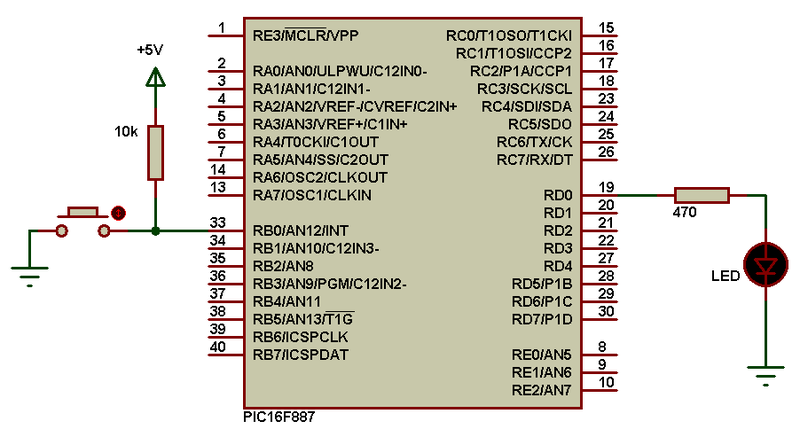 This is a small example shows how to blink an LED connected to pin RA0 using timer interrupts. 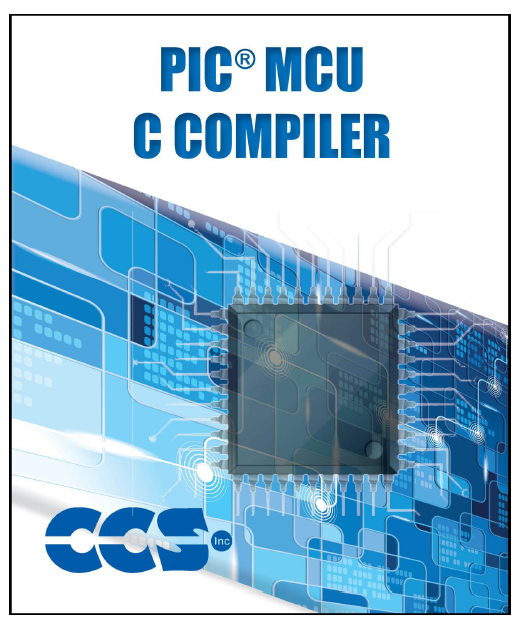 This simple post shows how to blink an LED using PIC16F887 microcontroller and CCS C compiler. The LED here is connected to pin RA0 as shown in the circuit schematic below and easily that LED can be connected to other output pin or other LEDs can be added to the circuit which require code modification. 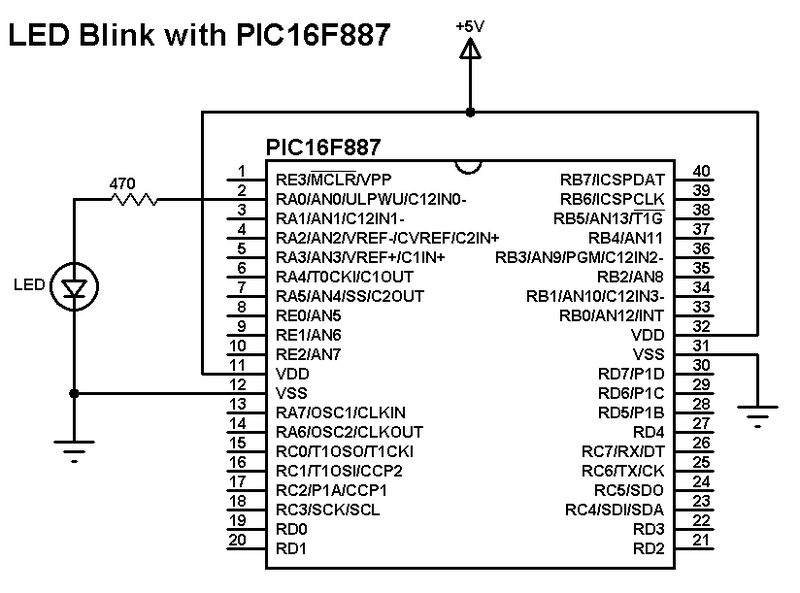 I this example there is no need for oscillator and MCLR circuits because the internal oscillator of the microcontroller is used at 8MHz and MCLR pin function is disabled (MCLR pin is configured as I/O pin).